I spiral down: War and Peace Read-along: Here we go! 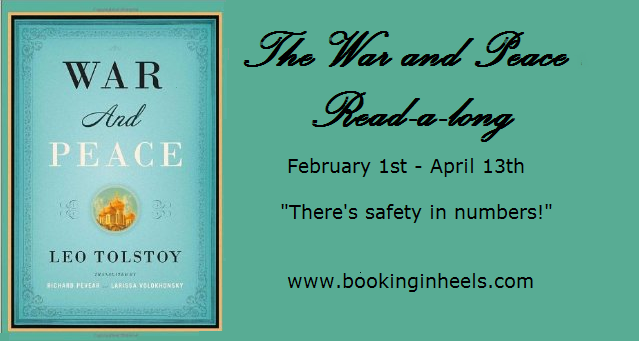 War and Peace Read-along: Here we go! For the next three months I am going to be reading War and Peace. I'm not entirely sure what I'm getting myself in for, but hopefully it'll all be okay. I have never read any of the Russian classics before (or anything that was originally written in Russian, I don't think - I did at one point know how to say "I like little pies" in Russian, so there's that), and I don't think I've read anything in translation for ages, so it should be interesting! I am a bit of a language geek (it comes with the being a translator territory I think!) so I am actually looking forward to seeing the differences in translation between the different editions that everyone is reading. It also means that rather than seeing the French in the first few chapters and going NOOOO, I was more like, ooooh I'm going to try to figure out what it means! I have heard there might be some German later, which I might actually be able to understand some of without looking at the footnotes. And if there is any Japanese in it (I seriously doubt it, but on the off-chance) then I'll be happy! Although actually thinking about it, any Japanese from that time period would actually be quite different from modern Japanese so I might just end up feeling sad at my inability to understand. Anyway, I'm pretty sure there isn't any Japanese, so I will stop rambling now! The length of the book is obviously somewhat intimidating, but I have read A Suitable Boy and Infinite Jest, so I'm confident that the length shouldn't be an obstacle as long as I don't hate the book. I already read a few chapters yesterday, and I am not only NOT hopelessly lost, but I am also actually enjoying it, which is a good sign! I also enjoyed the first few chapters of the Pickwick Papers though, so feel free to take my endorsement of the beginning with a pinch of salt. Looking back though, I can see how my experience with the Pickwick Papers turned from enjoyment to rage, and I can't really see the seeds of that here, so I'm being cautiously optimistic. If you are not already involved in the read-along and you're interested in joining in, you can see the schedule and follow a link to the sign-up page here. I'm enjoying this one MUCH more than Dickens, for sure! Me too!!! I'm definitely enjoying it too, I think that should make it much easier to catch up if you have time to. Yayyyyy! I didn't know what was going to happen with this readalong, but I really didn't envision myself enjoying it to this extent.